This summer has emerged as a pivotal time for e-reading apps. Google Reader is going defunct, AOL Reader has just been rolled out as a Web service, and rumor has it that Facebook is also set to join the party with its own magazine service à la Flipboard. Today, as promised, Digg has added reader features to its iOS app, which notably, allows users to import straight from Google Reader. The e-reading market has turned into something of a race to replace Google Reader, and thus far, Feedly has emerged as one of the primary candidate. Digg, which used to be the far and away force in catching up with the latest info, seems to have lost its way in the past few years, highlighted by the big v4 revamp a few years ago that seemed more of a step back than a progression of a popular service. But in the day of the smartphone and tablet, it’s all about the apps, and Digg’s offering for iOS is certainly competitive in the features it has brought to the table. By adding reader features and allowing effortless Google Reader importing, it’s certainly not going away anytime soon, and having briefly given it a try, I have to say I’m rather impressed. Whether it will pique the interest of thousands of Google Reader orphans remains to be seen, but while Digg may not be the go-to service it used to be, it’s certainly going the right way about trying. If you’ve never tried the Digg app, I highly recommend you give it a blast. The interface is clean, simple and minimalistic, and with Google Reader importing now a standard feature, you’ll be ready for when Google finally closes its doors at the end of the month. The search giant’s decision to close Google Reader has raised more than a few eyebrows, but despite countless petitions from lamenting users, most have simply learned to accept the fact that it’s going away for good. So, while you may be able to squeeze a couple more days out of Google Reader, now is the time to be seeking alternatives. 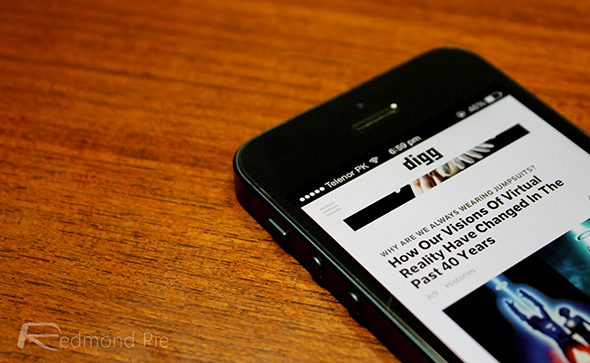 Check out Digg for iOS via the link provided, and be sure to share your thoughts in the comments section.